Cyberhomes completed the full home automation for this amazing luxury development in St johns wood. 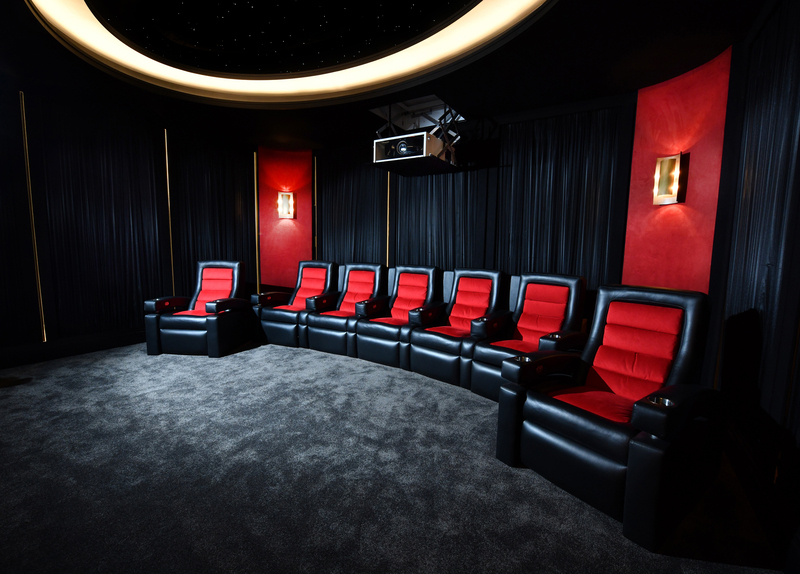 They approached us to work with them to complete the cinema room. We worked to the design to give the client the elegant, luxurious room they had dreamt of. We built out all walls to accommodate speakers and acoustic treatment, formed vertical channels for led lighting between panels and formed two curved sections in the rear corners of the room. There was an oval section of ceiling in place, but we formed the lower section of ceiling, again housing speakers and acoustic treatment. We also created the recessed housing for the drop down projector and supplied and fitted acoustic treatment throughout. We fitted our tracking system to allow fabric to be fitted. We then fitted black acoustically transparent fabric to ceiling and screen wall. We fitted black acoustically transparent fabric in a pleated fashion to back and side wall and fitted a red suede fabric to curved sections to match the seating accent colour.